Developers and manufacturers are constantly looking towards innovation in battery tech for mobile devices, just recently uBeam began prototyping wireless ultrasound charging. But now, a new piece of software is able to dramatically enhance the efficiency of charging on current gen hardware. A new company called Qnovo is working on software that essentially analyzes and tweaks the incoming charge signal allowing for much faster charges than we are used to. It is also reported to increase the efficiency and life span of the batteries that are using it. A device equipped with Qnovo's software is plugged into an adapter of sorts that fires of voltages to the phone or tablet which allows the system to keep track of things like the temperature of the battery as well a number of other bits of data. With this information, the adapter is able to feed power to the battery at a much more efficient rate, resulting in much faster charges. Normally, increasing the flow of power to a battery can cause degradation, but with Qnovo's software constantly monitoring the connection, devices are not only charged much quicker than usual but in a way that is safe for the battery as well. 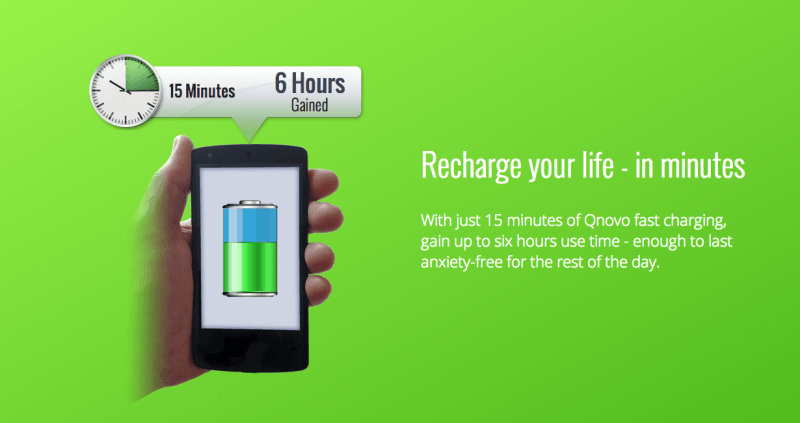 According to the company, a charge time of about 15 minutes on a standard smartphone will bring about 1.5 hours of talk time, but under the same conditions Qnovo's system provides 6 hours. While there is no clear indication as to which manufacturers are looking into the tech, Qnovo says devices using the software will appear as early as next year.